The Boy-Led Troop David Mitchko Mercer Area District Commissioner. 2 Why is it Important? Empowers boys to be leaders Boys plan and participate in the activities that they want to do Keeps the older boys interested in the program Integrates 5 of the 7 methods of the BSA: Patrol Method, Association with Adults, Advancement, Personal Growth and Leadership Support Scouting’s Mission: To prepare young people to make ethical choices over their lifetimes by instilling in them the values of the Scout Oath and Law The more choices you allow a boy to make, in scouting’s safe environment, the more he will learn how to make the right ones. 6 What Can the Other Adults Do? 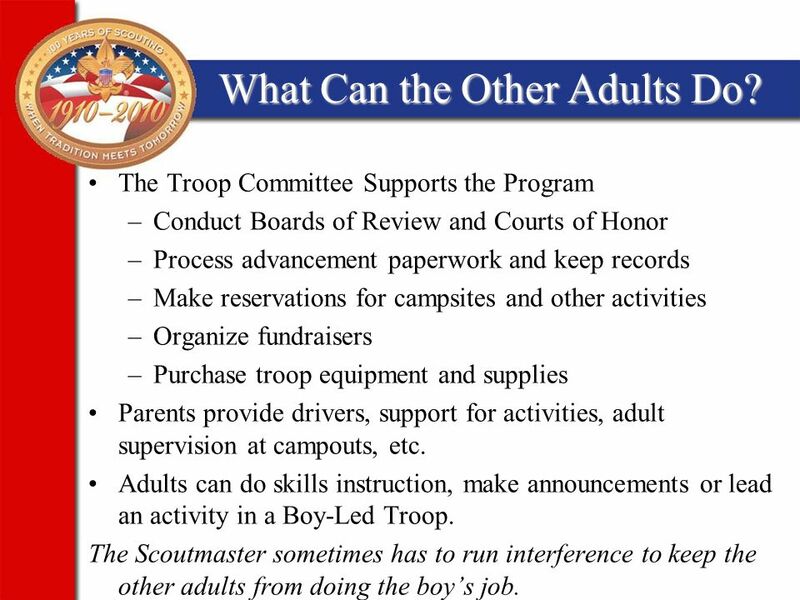 The Troop Committee Supports the Program –Conduct Boards of Review and Courts of Honor –Process advancement paperwork and keep records –Make reservations for campsites and other activities –Organize fundraisers –Purchase troop equipment and supplies Parents provide drivers, support for activities, adult supervision at campouts, etc. 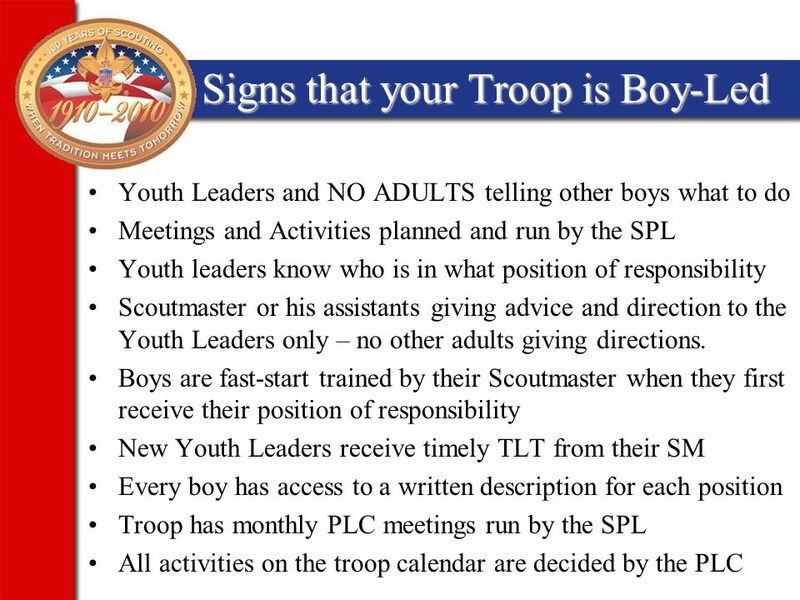 Adults can do skills instruction, make announcements or lead an activity in a Boy-Led Troop. The Scoutmaster sometimes has to run interference to keep the other adults from doing the boy’s job. 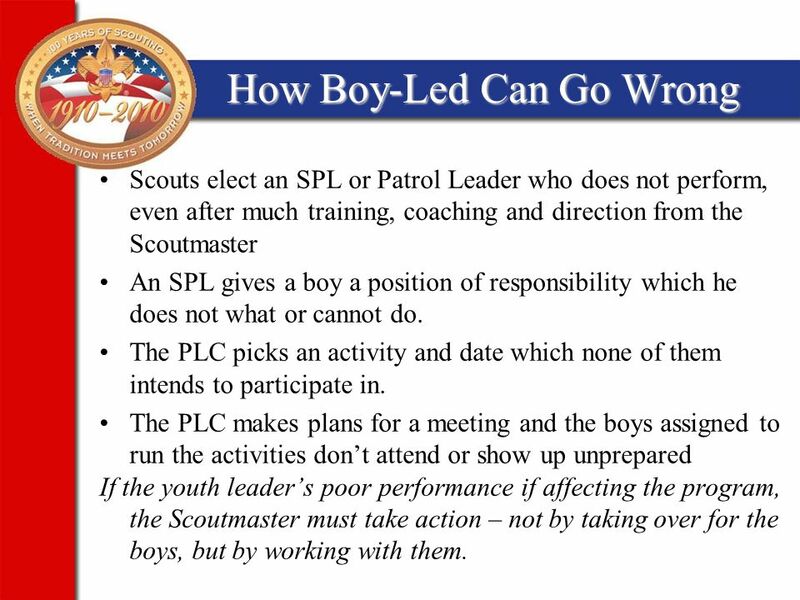 7 How Boy-Led Can Go Wrong Scouts elect an SPL or Patrol Leader who does not perform, even after much training, coaching and direction from the Scoutmaster An SPL gives a boy a position of responsibility which he does not what or cannot do. The PLC picks an activity and date which none of them intends to participate in. 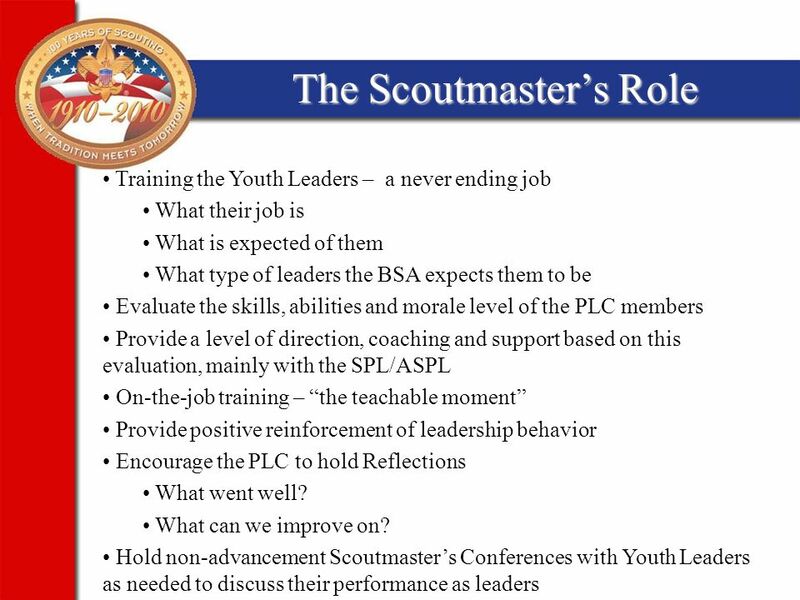 The PLC makes plans for a meeting and the boys assigned to run the activities don’t attend or show up unprepared If the youth leader’s poor performance if affecting the program, the Scoutmaster must take action – not by taking over for the boys, but by working with them. 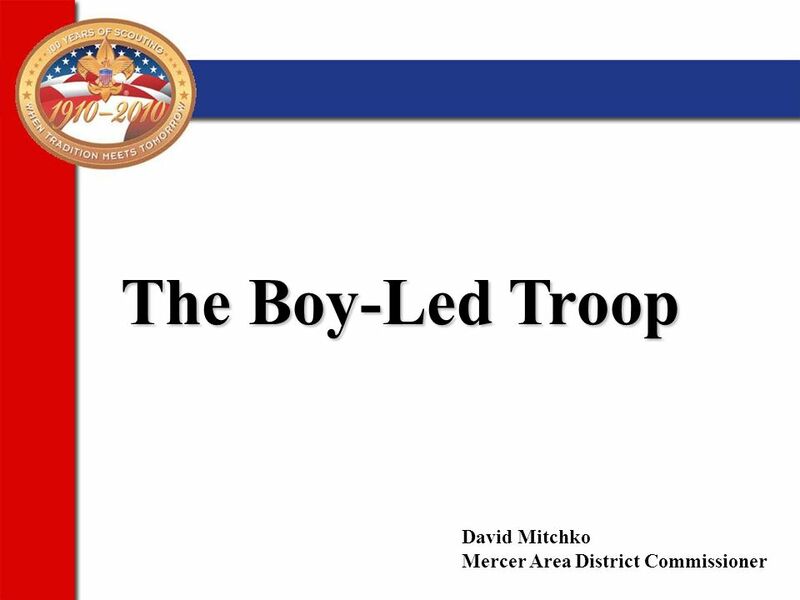 Download ppt "The Boy-Led Troop David Mitchko Mercer Area District Commissioner." 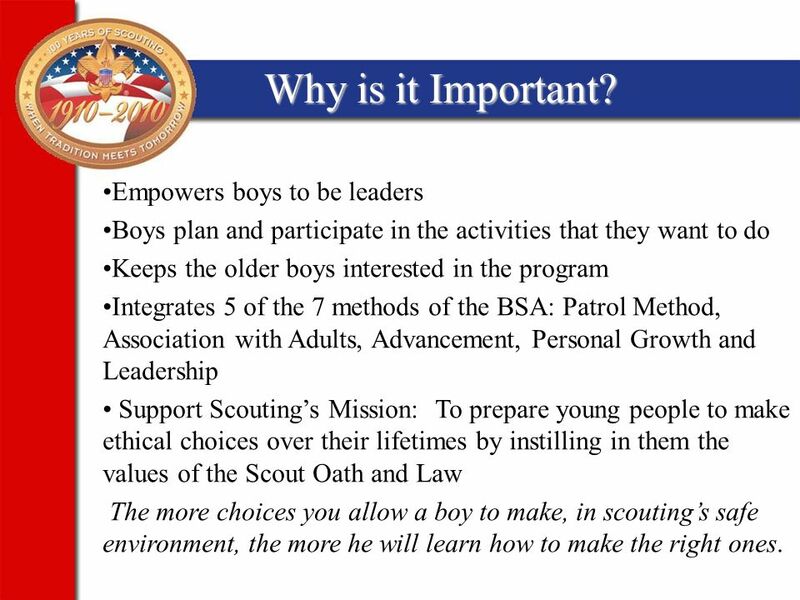 What is Boy Scouting “A Game with a Purpose”……Lord Baden Powell It is the purpose of the Boy Scouts of America to provide for youth an effective program. Scout Oath On my honor, I will do my best To do my duty to God and my country, To obey the Scout Law, and to help other people at all times, To keep myself. Troop Leadership Postion Descriptions. Learning Leadership (Know) – what do I need to KNOW for my position? How to Fulfill Your Role (Be) – what kind. Parent Information Meeting Parent Information Meeting Karen Evans Troop 575 April 10, 2007. Troop 720 Junior Leader Training 1 Troop 720 Leadership Training. Introduction to Leadership (KNOW) WE “KNOW” will provide the information that you need to successfully fill your leadership position. The Know. Youth Leadership Positions and Troop Organization Junior Leader Training Troop 1600 – Jordan UCC. 1 Session Three: Keeping It Going 2 Song Fest 3 Keeping It Going Program planning—annual planning conference Membership Paperwork Finances The uniform. Forming Pack & Troop Alliances. 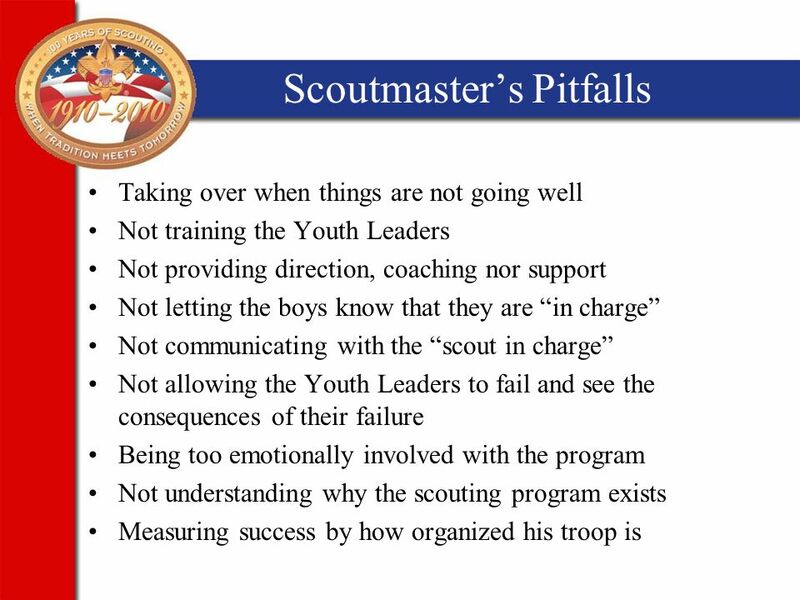 “Training boy leaders to run their troop is the Scoutmaster's most important job.” “Train Scouts to do a job, then let. Troop Meeting ( 團集會 ) April 4th, 2015 Wesley Y Chen T468. 1 Annual Program Planning T R O O P. Troop 160 Oneonta, Alabama2 What we are going to accomplish  We’ll know what planning is and why it is important. 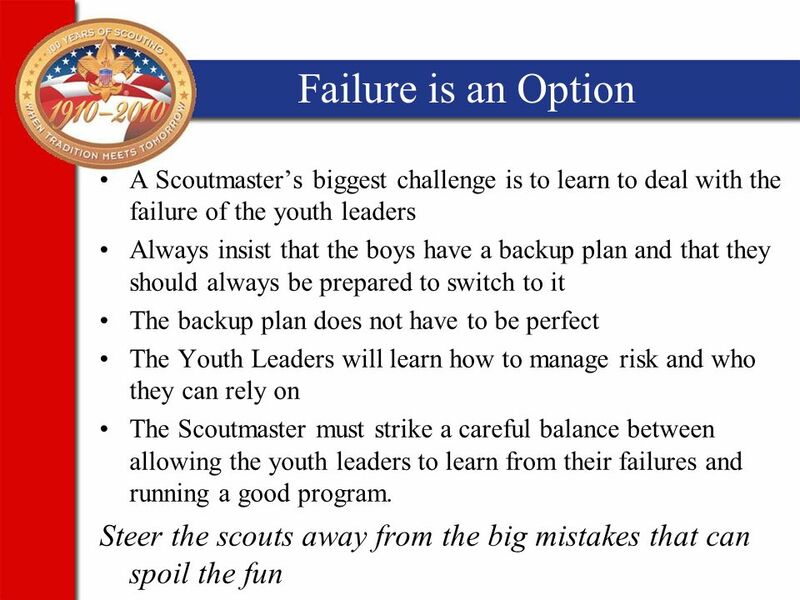 Scout Leadership Training.  What do you want to do?  Where do you want to go?  How often and when should we have activities?  Who should decide? Unit Committee Training. The Role of the Troop Committee Mission Statement The troop committee, which is the troops Board of Directors, supports the troops.